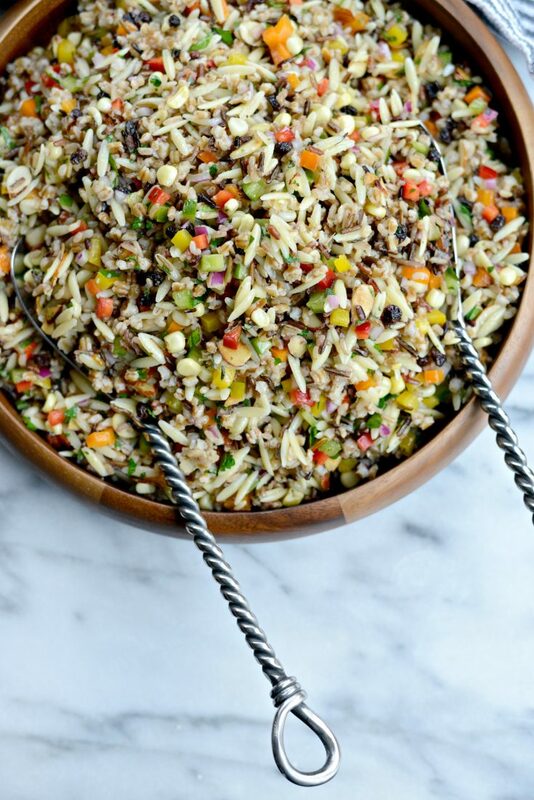 J. Alexander’s Wild Rice Orzo Salad made fresh and full of flavor! 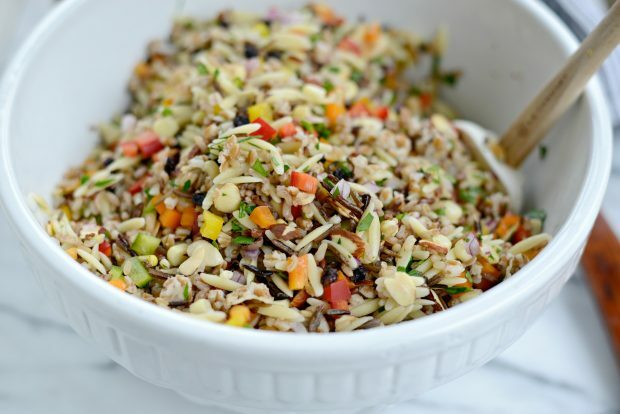 A blend of wild rice, orzo, vegetables, currants, almonds and in a champagne vinaigrette. 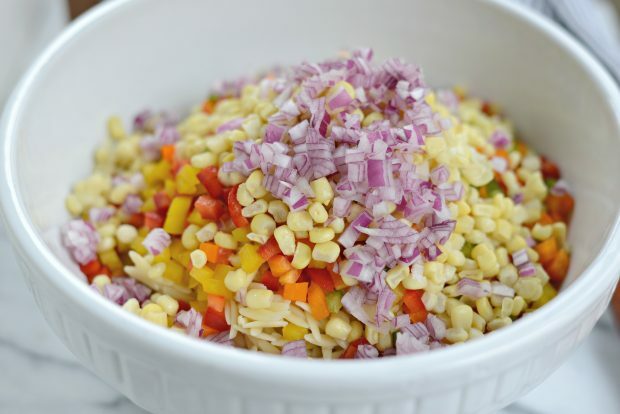 One of my favorite summer salads is the one you see below, with it’s abundance of ingredients and confetti colors. This is actually one of the first recipes I ever blogged. If you were to dig deep into the archives, you’ll see that it’s from way back in 2010, the writing is horrid and that I use way too many exclamation points. Oh wait, I still do. Ha. (Struggling not to insert these —>!!! )Even though realistically 2010 really wasn’t that long ago, I can’t help but feel like it was. When I think back to where I was in my life (29 and about to turn 30 with less laugh lines), career (I was a full-time employee, clocking in and out) and my daughters were 6 and 9 years old with most of their baby teeth *cries* and yet somehow this year they’re turning 12 and 15. That right there makes it feel like another lifetime ago. Waah! If I close my eyes I can still remember blogging that first post. My bff Nichole helping me chop (at the time I owned one knife and one cutting board) and mince and whisk, while I snapped photos with my crappy Canon point-and-shoot. I felt so professional. Never mind that the photos are shoddy, blurry, totally unappetizing and have since been deleted- at the time I thought they were AH-MAZING! They were so not. 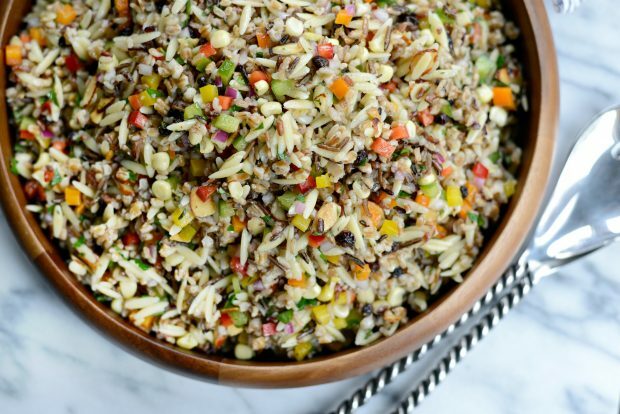 This time around, I’m giving my beloved wild rice orzo salad a redo with better photos, more precise, accurate and fresh ingredients… yet the same great, colorful, healthy and delicious salad. 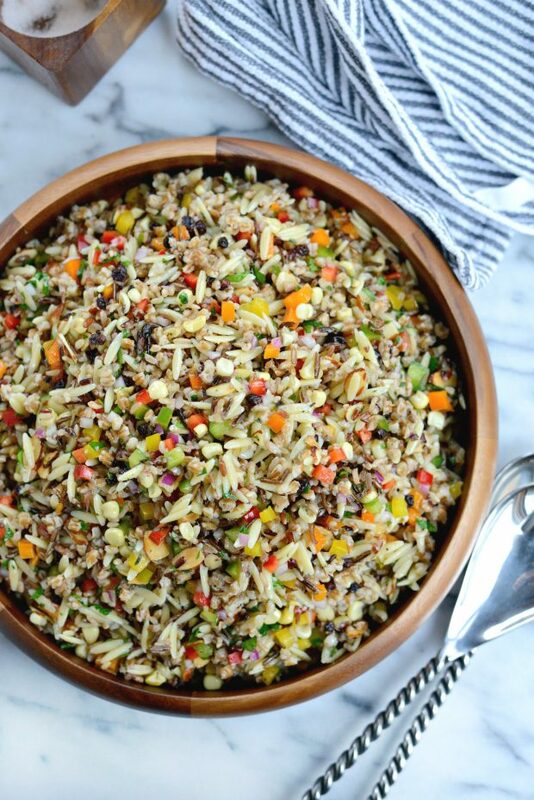 The last time I made this wild rice orzo salad, I just made a big batch of rice and orzo and didn’t bother to list the dry measurements. There was no red winter wheat berries- which I’m told it’s a salad must! Also, in 2010 I couldn’t find champagne vinegar, so I opted to figure out my own substitution. Now, in 2016 I’ve since found champagne vinegar and I’m also using fresh herbs instead of dry. The bottom line is that it’s just a smidgen different, the differences are minuscule. 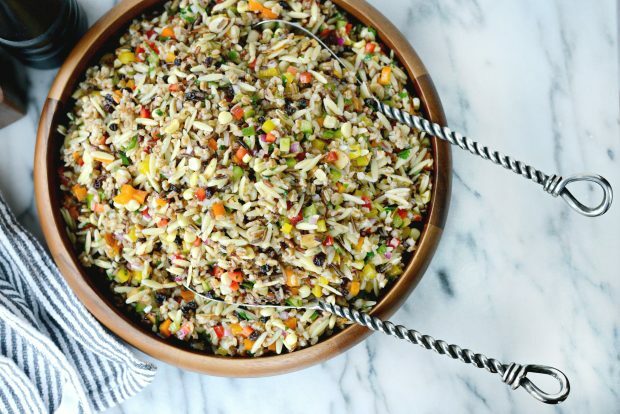 But this wild rice and orzo salad has never tasted more delicious and fresh. 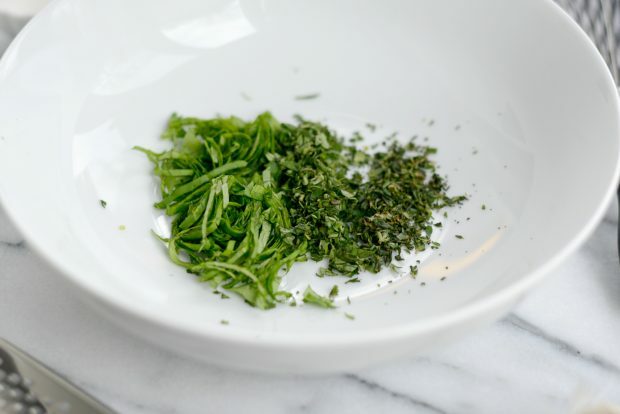 Into a bowl, jar or whatever you’ve got; add 1 tablespoon of thinly sliced basil, 1 teaspoon chopped fresh oregano and 1/2 teaspoon chopped fresh thyme. 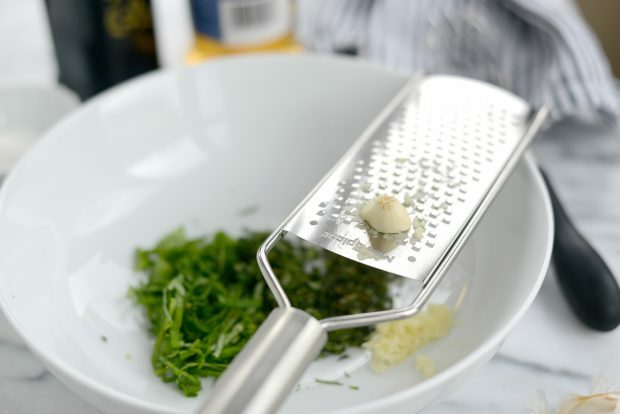 Then bust out your trust microplane and grate in a medium clove of garlic (about 3/4 of a teaspoon). 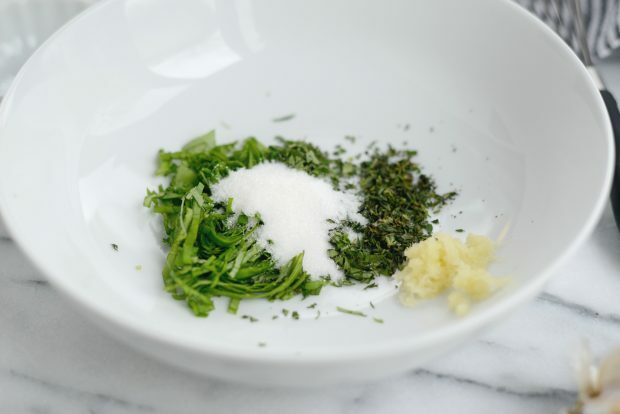 …then pour in 1/4 cup of champagne vinegar. Quite possibly one of my most favorite of all. 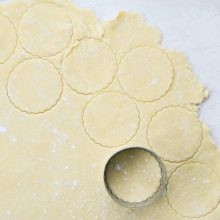 …season with 1/2 teaspoon of kosher salt and 1/4 teaspoon coarsely ground black pepper and set aside. 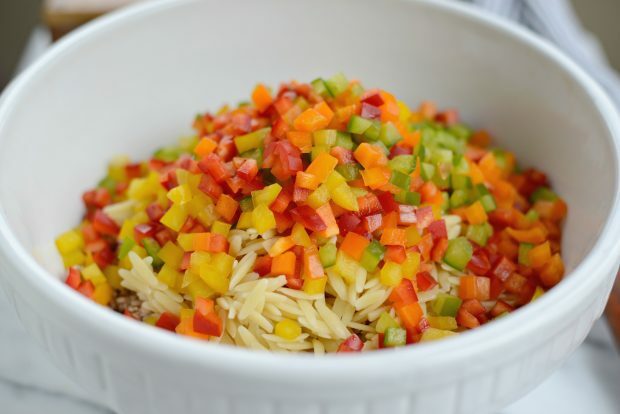 Then add in the 2 cups of cook orzo. 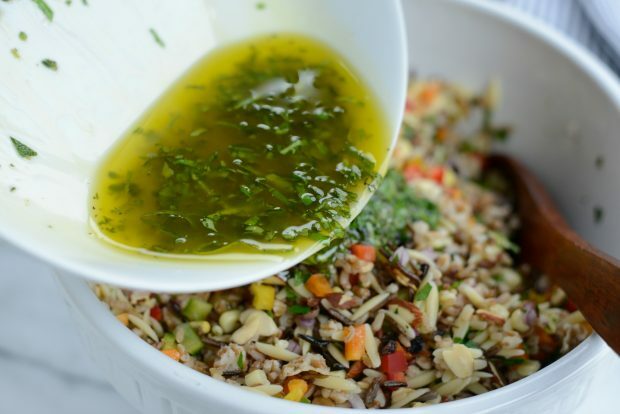 I used DeLallo brand because I think their orzo is the prettiest, all long and slender like. Then add in the beautiful and colorful peppers. That’s 1/2 cup of each color (red, orange, yellow and green). 1/2 cup pan-toasted sliced almonds. Lastly, throw in 1/4 cup chopped fresh parsley. To make the prep less daunting, I cook the rice and wheat berries the night before ( in my rice cooker) and then refrigerate it over night. Everything else I make the day of. There is so much texture and flavor happening here. 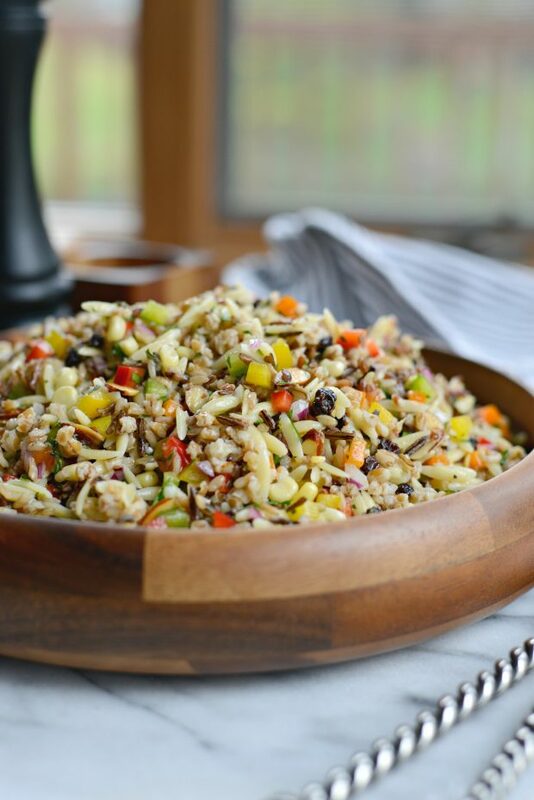 From the crunch of the peppers and almonds, the wholesome flavor of the rice and wheat berries… and that dressing! I think this salad benefits from some time in the fridge, I try to make it far enough in advance that it can chill for a few hours. 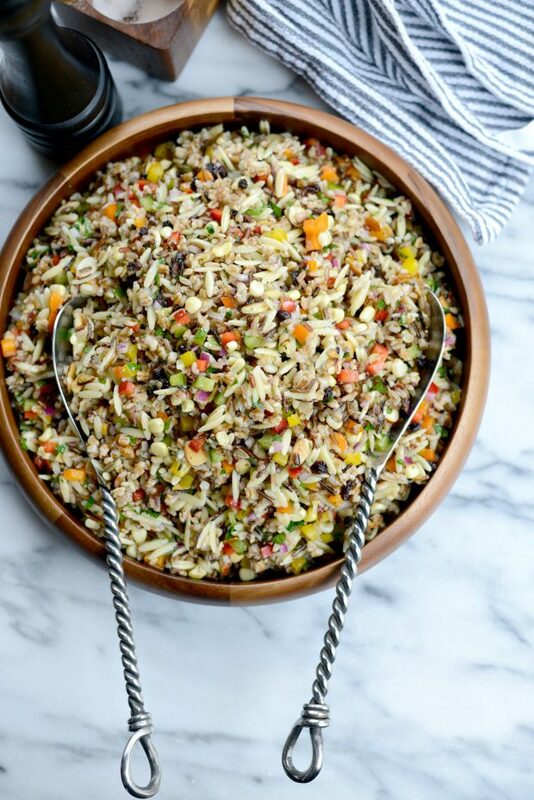 Serve this wild rice orzo salad as a side to salmon or shrimp, grilled chicken or as a meatless main dish. 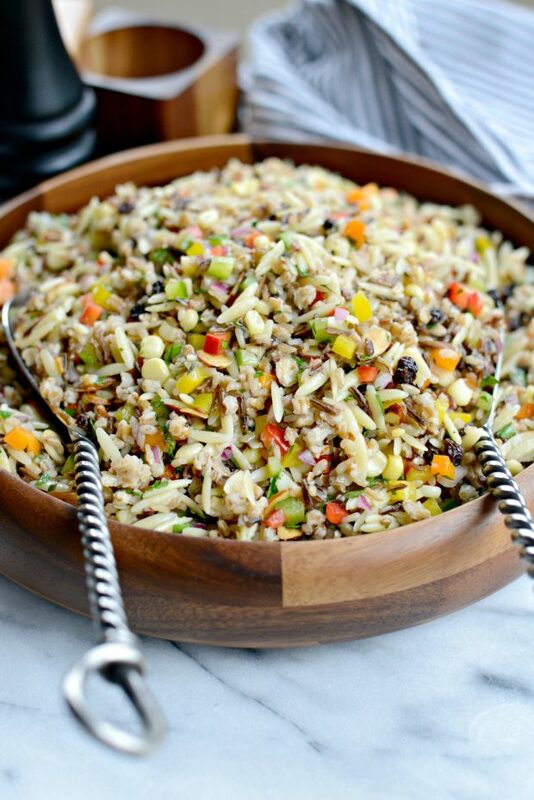 A deliciously fresh and colorful wild rice and orzo salad with a champagne vinaigrette. Serve this with salmon or shrimp, grilled chicken or as a meatless main dish. In a medium bowl add in the basil, oregano, thyme and garlic. 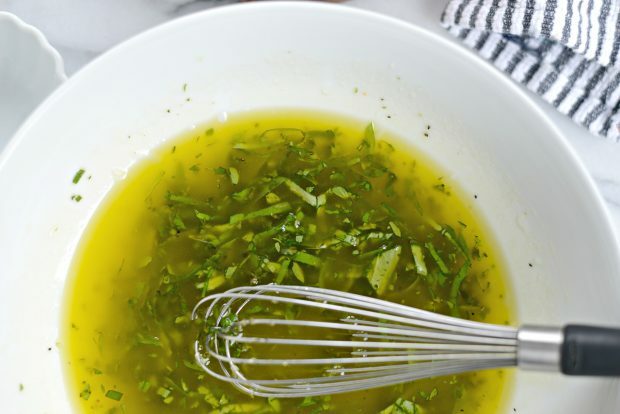 Add in the sugar, pour in the champagne vinegar and whisk while drizzling in the olive oil. Season with salt and pepper and set off to the side. 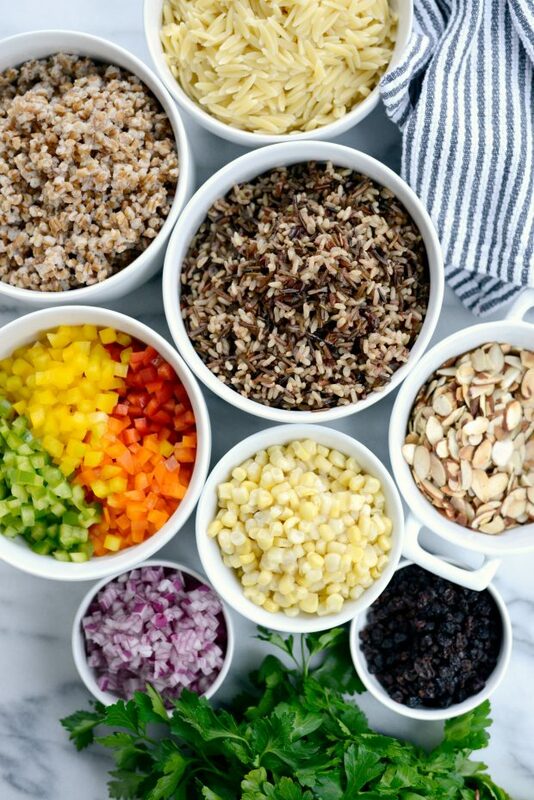 In a large bowl, combine the cooked wild rice, wheat berries, orzo, peppers, corn, onion, almonds, currants and parsley. Toss to combine. 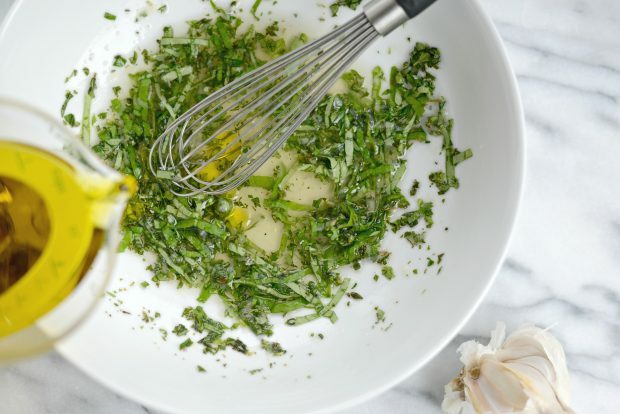 Pour in the champagne and herb vinaigrette, toss and either serve immediately or refrigerate until ready to serve. 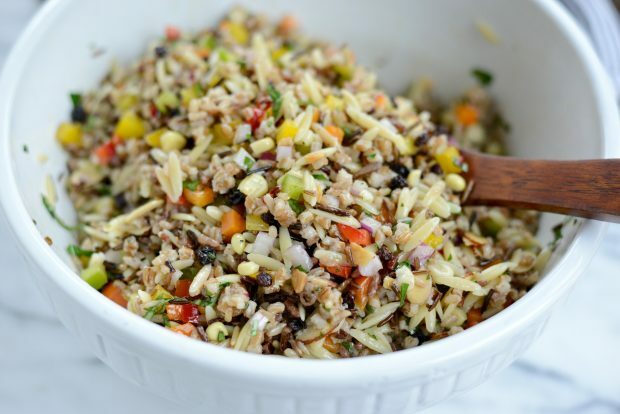 To speed this up, cook the wild rice and wheat berries (separately) the day before. 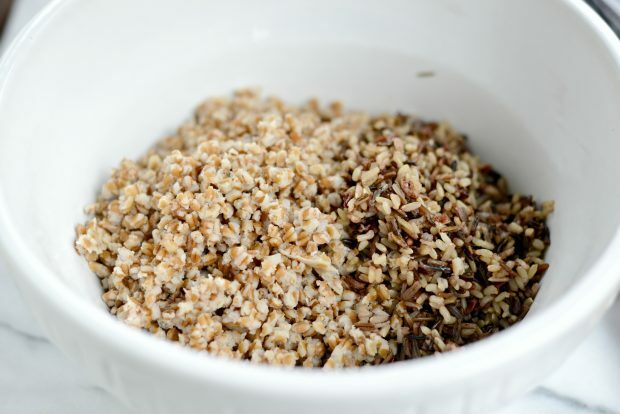 Before storing, measure each of the cooked grains so you know you have the right amounts. 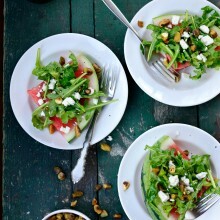 This will save you a lot of time when it comes to making the salad the day of. I made this last summer and LOVED it! I could not find the champagne vinegar though, so I used balsamic. Not the best choice, but it’s all I could find. What’s a better substitution for the champagne vinegar? Hi Kristen! 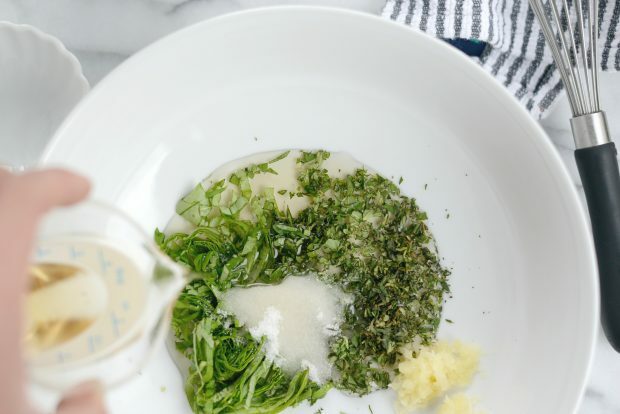 I would say white wine or rice vinegar would work just fine, but if you ever spot some champagne vinegar, grab it… it’s pretty mild and one of my favorites for a simple vinaigrette. Enjoy! 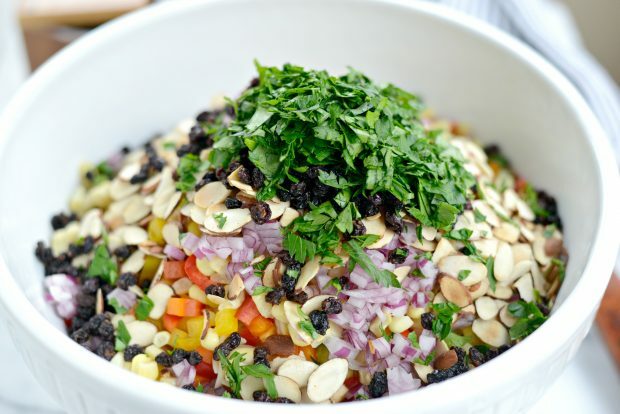 I love this salad!! I forget about it since I don’t live near a j.alexanders anymore. thanks for the reminder! 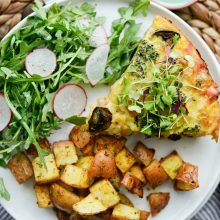 Where can I find red winter wheat berries? This is one of my favorite things from j Alexander’s. Wow, wow, wow! I made this today, absolutely delicious! One thing I noticed, after it sitting in the fridge a few hours, is that the dressing is soaked up by all that deliciousness. I’m making a second batch of dressing to pour over before eating just to moisten it up a little. Kathy O, I buy the wheat berries from a bulk country store, but my local supermarkets sell it, too, in the organic isle with the quinoa and rice. 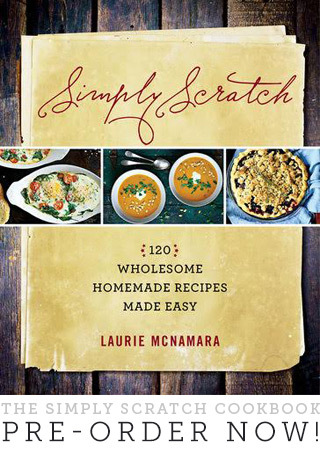 Thanks for the recipe, Laurie! 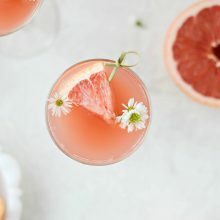 I’m making it again for Mother’s Day! This was great! I used dried cranberries because that’s what I had and I didn’t put in any wheat berries. It was delicious! Super simple and super tasty. I definitely recommend cooking the wild rice the day before like she said., it takes awhile to cook. Thanks for leaving a recipe review N! 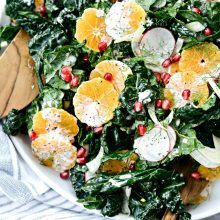 Question about the currants. Do you use actual black currents or zante currants? 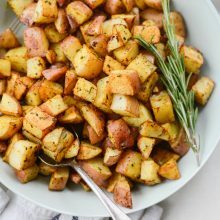 I’m hoping to make this for thanksgiving and want to make sure I can find all the right ingredients. Oh great question, Jamie. Dried zante currants! I’ll update the recipe to reflect this! Enjoy! 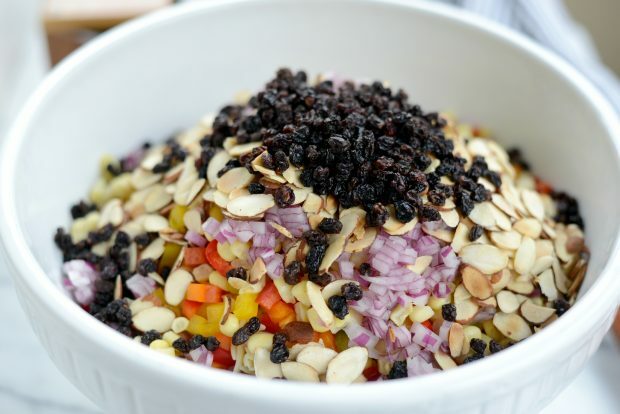 I love this salad and have made it a couple time as well as get it from J Alexanders as often as possible, the restaurant actually puts black currants and cranberries in the salad and they do seem to add some extra flavor. Hi Paula! I’ve never noticed cranberries in it when I’ve had it at the restaurant, but adding them couldn’t hurt! I purchased the salad yesterday and had it for dinner last night. It was my second time eating this beautiful salad and it surprises me how much I enjoy it. I am going to try and make it myself. I had this in 2005 several times at J Alexanders in Baton Rouge. So worth the effort. 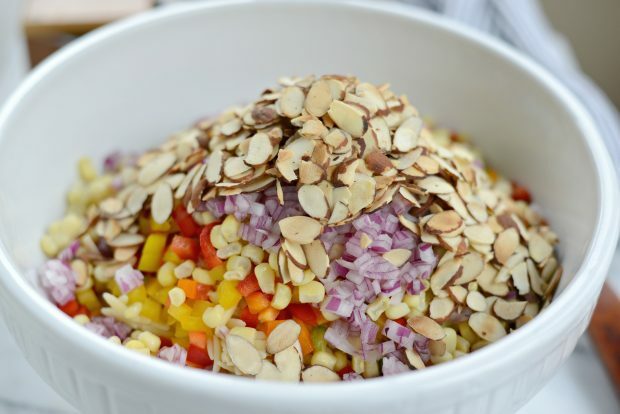 The best rice salad or side i have ever had. I made this today and found I cooked more rice and wheat berries ( following your direction) than the recipe calls for. Also, I had to cook more orzo because there was hardly any. I wish I knew how to send a picture, as yours is so white with orzo and mine isn’t. Still good though! Thanks for the recipe. Hi Josie! 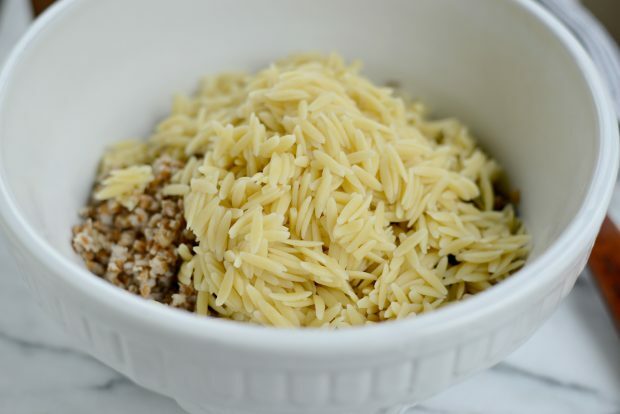 When cooking grains and pastas, it’s hard to yield exact and precise amounts, so I recommend cooking the amount as directed and then measure the cooked grains afterwards. 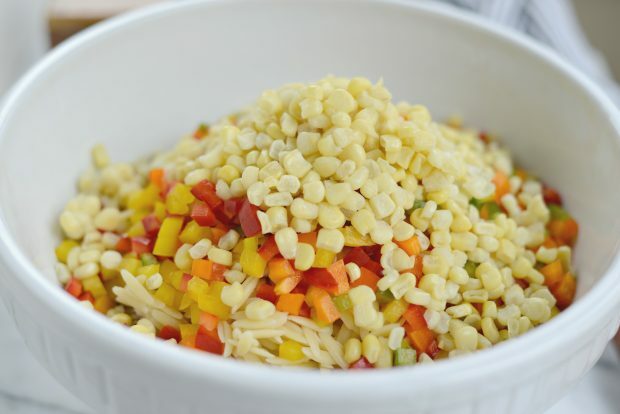 This way you make more if needed, and I’ll usually save and toss any extra cooked grains in a salad or something. This dish is the main reason why I go to the restaurant. I just by chance had it the first time I went and have always had it every time I’ve gone back. It is really amazing. I am glad I looked for the recipe. Went to JA tonite and had this salad-it was so good, i was jumping up in the air hugging myself, like Muttly used to do when given a bone by Boris Bedanov. Unfreakingbelievable! This salad is insane!!!! !